You wont believe it but the above photos are only for dreamers. Yes, the iPhone in the image costs $15 million that is 15 followed by 6 zeros and approximately Rs.82 crores 50 lakhs. Wow even the richest may think twice before buying this one. Called the Black Diamond iPhone 5 it is hand crafted by Stuart Hughes. Stuart Hughes who is a known luxury Apple devices designer has crafted this phone with a rare black diamond and other precious metals. And guess who the buyer is, you guessed it wrong its not a American or European but a Chinese who has commission the manufacture of this, the world costliest phone. It took Stuart Hughes nine weeks to recreate the chasis of iPhone 5 in Gold and the then he hand crafted it with various precious stones. There is a single, flawless, deep cut 26 carats blak diamond in place of Home Button. 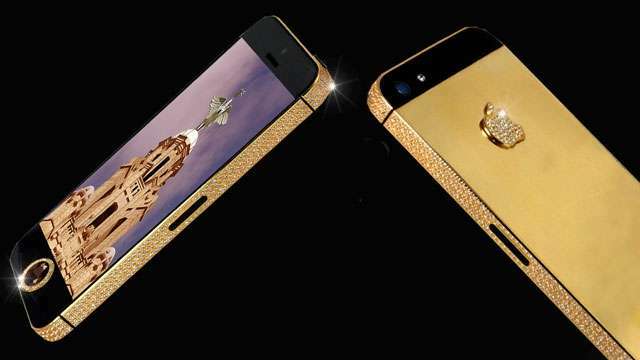 The iPhone has 600 white flawless diamonds and full gold back. The total gold used in the making of the phone is 135 grams. The Apple logo on the rear has 53 flawless diamonds. Whatever he will do with it, but certainly he can't flaunt it like we flaunt our SIII or iPhone. Please write in your comments about the above iPhone.